Welcome to Episode 21 of the Craft Seller Success podcast. Lots of hints and tips to help you get ready for a craft stall and help ensure it is a success. Listen to the Preparing for a Craft Stall or Craft Show podcast here, download it for later or read the transcript below. Hi, I’m Deborah Richardson from Tin Teddy. When I was a child, my father used to organized regular craft shows in my home town, on behalf of various organizations. Naturally, I ended up getting roped in and had my first craft stall, selling knitted coasters, when I was about 9. And I have been doing craft fairs and shows ever since, selling a wide range of different products over the years. In today’s episode, I will be sharing some of my experience and talking about preparing for a craft show or event. As usual, there will be links and a full transcript on the Tin Teddy Blog, plus a link to a free craft stall checklist. If you have never been to a craft event before then it is well worth going to one before doing a craft stall yourself to see how they work. You will also be able to gather lots of useful info on topics such as how to display items similar to your own, your potential competition, and what sort of prices items are fetching. This may be in a village hall, school buildings or outside in a field. May be in the school hall and/or other buildings or outside in the playground or sports field. The school children will convince their family to attend. Ideal for low priced, pocket money items but it may be harder to sell higher ticket items. It is best to avoid very delicate products at this sort of event. These are usually outside. Similar to the local craft fair or school fair. Lower priced items tend to do well, people don’t often go to a village fete with a pocket full of money. Often outdoors but may have indoor locations too. Obviously, it is ideal to bring products that are suited to the theme of the fair and to leave items that are very out of period at home. You may be required to dress to match the theme of the fair so make sure to confirm this in advance. Almost always indoors. Be sure you know in advance what types of product are accepted and whether yours qualify. Some art shows may be for paintings only, or even one medium only, such as watercolour. These are pretty much always outside! People at car boot sales are looking for serious bargains and so it is unlikely you will be able to sell high ticket items in this sort of venue. Many craft sellers have had frustrating experiences at car boot sales with very low sales. However, lower priced items may sell well. These are undercover, although many shows will also have external booths or stalls available). Very similar to a local craft fair though you may get more passing traffic if the show has other attractions to bring people in. Check in advance if there are any limitations on the type of products that can be sold here. “Folk-style and rural type” products may well do better than others. I know quite a few craft sellers who swear by farmer’s markets and do them regularly. Shows where the organizers will see your products in advance and decide whether you are suitable for their show. Curated shows often have higher priced items than non-curated ones. Customers will be looking for unique products and high quality. There are some things that it is important to know about before you book your craft stall (or which you need to find out when booking). How much is a stall? What is included? When will you be required to pay; upfront or on the day? As this is particularly important, I will talk more about this in a minute. How many stalls will there be – will there be others with similar items to you? Some show organizers will deliberately try to maintain a good balance of stalls, such as only allowing one of each type; one modern jewellery, one vintage jewellery, one bridal jewellery, one watercolourist, one oil painter and so on. Or they may have a more general balance in mind; five jewellery stalls, three painting stalls, three soft toy stalls, two candle stalls and so on. But many shows are not specifically balanced and so you may be in a room with many others selling similar products to your own. Is the venue inside or outside? You will need to know whether you will need protection from the elements. Some products may be hard to sell outside due to factors such as wind, precipitation or sunlight. This is a very important piece of information indeed. Are the organisers charging people to enter? High price entry may indicate the sort of visitors who are likely to come to the show. Is there likely to be much passing traffic? Is the event somewhere that people will naturally pass by, such as a busy shopping street or part of a bigger show (such as a craft tent at a county show)? Will there be self-contained traffic? A school fete will gain some “automatic” traffic from the parents and family of the pupils. A local steam rally will have plenty of visitors who have come to see the other attractions on offer. How will the event be publicised? Many events are advertised in local newspapers, magazines, shops and on Facebook and other social networking sites. Lots of publicity will help visitor figures which can boost your sales potential. It is always worth doing some publicising yourself too. If you require a power socket for lighting or demonstrating your crafts be sure to check in advance that this will be available. You may be charged extra for this feature or it may require your booking a particular stall so as to be near the sockets. How long is the event on for and when can you arrive? Be sure that you know the duration of the event. A friend was caught out when she booked a rather expensive stall only to find out, after paying her non-returnable deposit, that the show was actually only two hours long. She had assumed it was all day and was unable to sell enough stock to cover her costs in just two hours. It is usual (and desirable) to set up your stall before the show opens to the public. Find out at what time you can enter the premises or location to begin setting up. Will there be somewhere to get lunch or a drink? If you are going to be at an all-day show or one that crosses a meal time, will there be somewhere on hand to purchase something to eat or should you bring your own. Many stallholders always bring their own sandwiches or similar as they find this the most economical option. I personally like to buy a hot dog or burger if doing a stall outside in cold weather for a little burst of warmth. Are stalls supplied or do you need to bring your own? Some craft events will provide tables for the sellers, particularly large shows in exhibition halls or permanent events. Others will require sellers to bring their own tables or stalls. Make sure you know which applies for the show you wish to attend. If you will be using the organisers’ table, find out how big they are as soon as possible so you can tailor your display to fit. And if you need to bring your own, check whether there are any restrictions on what you can use, what size limits or how many tables you can use. If you only do a few craft shows a year or are starting out then a basic wallpaper, or paste table is ideal: they are cheap, sturdy, lightweight and roomy. If you intend to do regular craft shows then you may prefer a sturdier and smarter table option. You may also want to check whether chairs or stools are provided or whether you will need to bring your own. I have a couple of very sturdy folding chairs, the sort with arms for this (link at the bottom of the page). Some shows have a theme which you are required to comply with to have a stall there. For example, many renaissances and other historical fairs will stipulate that all stall holders are dressed in clothing that is suitable for the period. Christmas-time shows may want stall holders to dress in suitably festive attire. Some types of event may have a dress code. A high-end art exhibition may require evening dress or a classy craft show may rule “no jeans.” Be sure to know what the rules are in advance… and stick to them! Will there be a creche for stall holder’s children? Larger shows may have one, but definitely be sure to check before relying on there being one. The type of stall you have can affect the cost. Be sure you have the right insurance for the type of stall you use. Many organized craft fairs and shows will require stall holders to have this. Even if they do not specifically ask for this, it is still worth having it for your own peace of mind. If you sell products that could potentially harm the user such as bath and beauty products, candles or anything electrical then I strongly recommend liability insurance for your protection. You would require this wherever you sold your products, including online. Many crafters, especially when starting out in craft stall selling, choose to share a stall with a friend or family member. Each person has their own products on the same stall. This can be a great way to split the cost of a stall, to ensure a companion/assistant when actually selling and of course, can be a lot of fun. If you are thinking of sharing a stall with someone else, please do consider some of the possible problems that can arise from this arrangement. Be sure to know in advance how you are going to divide up the takings, share the costs and who is going to do the various actions required such as driving. I have discussed sharing a stall in much more detail in a blog post on the Tin Teddy Blog – Sharing a Craft Stall – A Craft Stall with a Friend. There are two big questions with paying for your stall = how much should you expect to pay and when will payment need to be made. How much is the going rate? How big a show/fair is it? How well advertised and promoted will it be? What sort of show it is? How many people are likely to visit? Are the visitors likely to be expecting to spend a lot or a little money on products? So basically a small local event may charge just a few pounds for a small table, or even ask for a voluntary donation from your sales. Some ask for a fixed percentage of your sales, but as this relies a lot of trust (how would they know how much you actually sold?) this is now quite rare. Where I live the current rate (2019) seems to be £25-60 upfront for smaller craft fairs. Big, well attended, highly publicized events are likely to charge far higher prices. You will need to be sure that you have enough stock to sell to warrant this upfront cost. If the stall costs £100 then how much do you need to sell to justify this expense? If your items are just a couple of pounds each then you will need to have many hundreds of sales to make any profit. Don’t forget you still have your usual expenses of materials and time etc to subtract too. Are you likely to sell that many items? Do you have that many available in stock? How much will I actually pay? Be sure you know exactly how much your craft stall will cost. If you have asked for a larger space, a special location, power points or other ‘frills’ then the cost may be more than the basic quoted rate. Bear in mind that different sellers may actually be paying different fees for similar stalls at the same event. Some events give certain sellers a discount to encourage them to come to the show. They might do this for a stall that itself will attract further visitors such as someone who is very well known, is demonstrating their craft or is marketing the show themselves. If you feel you have some significant extra to offer the event it may be worth asking if any such discount is available but be careful not to offend the event organizers. Different types of products may also dictate the cost of the stall. Some lines of products are far more popular than others. An event organizer may offer a discount to someone with unusual products to try to encourage diversity at the show. Check that you know when and how the organizers require payment to be made. Many will want it in advance but some will collect it from you on the day. Others will require a non-refundable deposit up-front with the balance collected from you on the day. Get a receipt, printed or email which you can print out, for your future reference. This is exactly the sort of legitimate business cost that you should include in your tax records! So make sure you keep that paperwork. If paying on the day be sure you have the correct money (or a cheque if that is acceptable, check first) separate from your float. I usually put mine in a clearly labelled envelope. Don’t forget that you may have other costs to take into account. Does the venue pay for insurance for the stall holders, or do you need to provide your own? (it is often obligatory that you do). Will you need to pay for food and drink, or bring your own? Will you have to pay to park your car nearby? If your stall is going to be outside then you need to consider whether you might need any weather protection. Battery operated portable fans can be a handy accessory on a very hot day. Make sure to wear a hat if you are outside, to protect against sunstroke. Sunblock is also important. For many types of stock, it is essential to protect your stall from the rain. A large, thin, clear plastic sheet can be a very economical and useful accessory. If it starts to rain you pull the sheet over the whole stall and hold it in place with pegs or pins. Customers who are braving the rain can still see what you have on offer and if they want to buy something you can slide your hand under the sheet to grab it. Once the rain has stopped you can flick off the sheet until another shower starts. If the weather looks like it might be rainy on the day of a show, ensure you have some plastic bags with you to pop customer’s purchases into so they can take them home safely. Many craft stall traders swear by fingerless gloves! They will help keep your hands warm on a cold day, but still allow you to handle your products – and the customer’s money! If you are selling woolly hats, scarves or gloves then this is the ideal opportunity to showcase one of your creations yourself. If you are going to be standing on a cold surface such as concrete, bricks or stones on a cold day you may benefit from placing a couple of pieces of cardboard, a piece of camping mattress foam or an old folded blanket down to stand on. It is surprising how much difference this can make. A lot of craft stall sellers like to use a seller’s apron. It has a number of deep pockets to store your money and other useful items. Because the money is always on your person it is nice and safe, plus you have a useful location for things like a mobile phone, scissors, pen and notebook etc too. If you store your cash in a box of some sort, be sure you have a very safe place to put it. You will need to ensure that you can see it at all times and it is not going to be in reach of stall visitors. I have heard many stories of sellers who have been distracted by a bogus potential customer whilst an accomplice grabs the money box and vanishes into the crowd. It is worth considering what sort of float, or change, you will require. If you have a lot of items that are something-and-50p then you will probably want a few 50ps to give as change when people give you round pound values. If you have items that end in .99p then you will need some pennies. Think about what currency the customer is most likely to hand over and this will help you decide what specific coins and notes you will require. This is one of the reasons that many craft stall sellers like to price their items with “round prices”, as it avoids lots of small change requirements. Be sure to make a note of how much float you have at the start of the show so you can subtract this from the day’s takings to get an accurate profit figure. How much stock should I take? Your first priority will usually be to have enough stock that you can cover the cost of actually doing the show with enough left over to make it worth your while. If selling all your available stock will bring in £200, of which £50 will be profit, then a stall that has cost you £60 means you will have actually lost money, which is obviously not an ideal scenario. And of course, this is assuming you sell ALL your stock! It is very important to be aware of the profit margin on your individual items of stock. This is a basic business essential wherever you sell. You may want to concentrate on only making items for the show that have a good profit margin, leaving your lower margined items for sale elsewhere. See episode 11, Craft Prices – Setting a Product Price for Craft Sellers for more on this subject. Consider the size of your stall. You will want enough stock to fill it nicely, plus some extra to replenish it as things start to sell. Again you could consider concentrating on larger items if necessary. A half-empty stall at the start of the event will look a bit sad. Many sellers aim to have enough stock to keep the stall mostly full for the first half of the event’s duration. After that, it is fine if gaps are showing, indeed it could be considered desirable as this shows visitors that you have been selling. If your products are generally in a higher price bracket, you may want to consider adding some lower priced items too. Think about the type of show you are attending. Whilst a gala art show with expensive tickets and champagne flowing may well be the ideal place for selling original paintings with price tags of hundreds or thousands of pounds, those same items are likely to be admired, but not actually purchased at a small local art or craft show. For these smaller venues bring your lower-priced prints and make sure you have plenty of business cards or information leaflets to give out. Sometimes it is worth taking one or two special pieces to a show even though you do not expect to actually sell them at the current venue. This is an ambassador piece, a product that really shows off your skills. There may be some products that you sell in an online shop but don’t (or can’t) sell at a live event, such as personalized items. You could have a display book available with pictures of these pieces, to show to potential customers or flyers with details. You will need to pack your stock safely for transport to and from the craft event. Work out in advance how you intend to do this so you are not fluffing about for boxes and bags just before leaving. Look at ways to save time on the big day when packing your items. You may be able to add some items to a display stand in advance, for example, so you can just pop it straight out on the stall, ready to go. Pack price signs with the products they relate to. Think about the item you will need to put on the stall first, such as the covering and large display shelves etc and ensure they are packed so they are easy to get out before everything else. Ensure you know how you are getting to the event and whether you can park near to your stall or not – if you are going to have to transport your stock from a car to the stall, how will you manage, especially if you have heavy or delicate products. Again, plan this in advance for a relaxed start on the big day. Remember to pack any necessary documentation. This may include your insurance certificate, trading licenses if they are needed where you live and any paperwork you require for the products you sell. For example, if you are selling items that use trademarked such as cartoon or movie characters, be sure you have the paperwork to prove you are officially licensed to use those characters. The show organizers may ask for it. If you are not licensed to use the characters then you should not be trying to sell them, it is probably illegal. I always have a notebook and pen with me so I can write down customers contacts and enquiries etc if needed. If you sell customised items or intend to take orders at the show, which you will then send to the customer when finished, consider pre-printing some forms for them to fill in. This can make the process much easier on the day. Be sure that all your products will be clearly priced. I am often really bugged at craft shows when I see lovely items but have no idea how much they are. Remember that potential customers may not want to ask you how much something is. They are more likely to just move on. There are two ways to price your craft items. 1 – you can label each item with a sticker or hang-tag. Be sure the price is in a visible place. I have often seen, for example, people selling lovely plush toys with the prices stuck on the bottom. For a visitor to see the price they will have to pick up the toy and turn it over. Do you really want a bunch of different people handling your toys… sticky or dirty fingers and all? 2 – you can have a single sign next to a group or similar items. This works very well for small items, or, of course, when you have multiples of the same type of item. Be sure the price sign is big enough to read. Your prices must be clear and readable and robust. Prepare them in advance and ensure they look good. When selling hand-made products, hand-written price labels may actually be part of your branding. If you are not confident that you can create smart hand-made labels, use a computer and printer. But please do not use a marker pen and scraps of card at the show itself. Hastily made price labels can ruin an otherwise professional-looking stall. Make sure any safety necessary information is clearly visible such as age limits on toys, CE marks, fire hazards warnings and so on. For food and bath and beauty products the ingredients should be on the item and clearly visible to buyers – add “Contains nuts” signs etc if needed. Cash is still king at craft shows. Especially if you are selling low priced items. There are a few other ways to accept payments nowadays, which you may want to consider, especially if you sell higher priced items. Both Paypal and Square offer handheld card readers and phone apps that allow people to pay you via those services. There are also options like Apple Pay, Google Pay and Stripe that work through phone apps. Do a spot of research into your options and make sure you choose one that your target market is likely to want to use. If you intend to use something like this, be sure to set everything up in advance so you know it will work well on the day. Also be sure you have a spare battery pack for your phone if you are concerned about getting a lot of sales this way. You could also give the potential customer a leaflet or business card and direct them to buy via your online store if you have one. I have heard of sellers having their online store open on their phone or a tablet so that customers can shop directly! For some types of products, this may be something you would want to consider doing. Pens and card just in case I am missing a price tag! 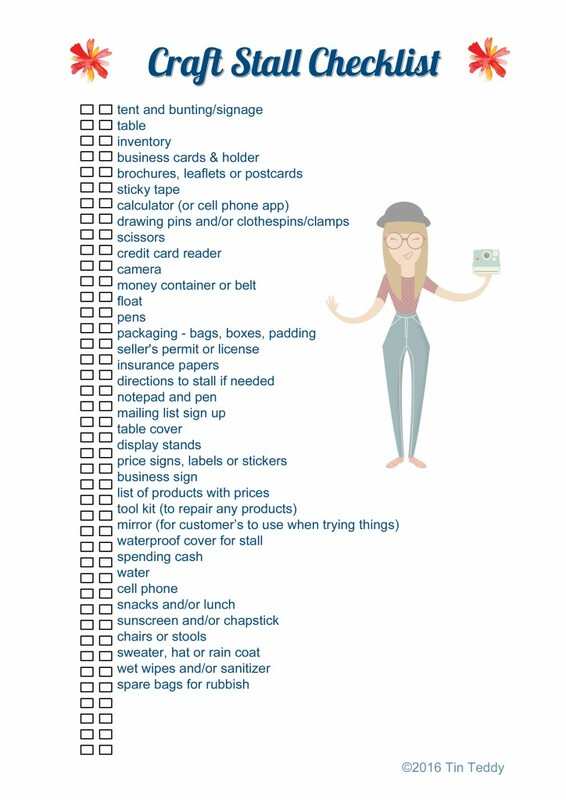 You might want to use this handy free checklist for craft event sellers. It can really pay to assemble your craft stall at home before doing a craft fair, I call this a craft stall dress rehearsal. This avoids the stress of discovering on the day that you don’t have enough to fill the area, haven’t really got a good way to display certain products, can’t arrange them so everything is easily seen and so on. Set up your table somewhere safe and dry at home and cover it with the cloth you will be using on the day. Spend some time rearranging things until you are happy with the layout. Remember simple rules such as putting smaller things in front of larger ones. Also, consider things such as keeping very delicate items out of reach of small children. Experiment with different ways to display your items. If possible, leave your table up overnight so you come back to see it the next morning with ‘fresh eyes’. You may well spot things you hadn’t the day before. It is also a great idea to have a friend or family member look too and see if they spot any things you could improve. I usually use my phone to take a few photos of the setup stall so I have them with me on the actual day for reference. I will cover this in depth in a later podcast. I’d recommend having a look on Pinterest, for “craft stall display” and similar searches. You will find all sorts of practical, interesting and exciting ways to display various types of crafts. Here is a link to the board I have created on Pinterest called “Craft Stall Display Ideas“. There are some sorts of signage that you may need to display. For example, in your country or state, you may have to clearly display your trading name and address. Or you may need to put up a sign for safety reasons, such as to warn customers that your baked items may contain nuts. Be sure you are aware of what rules govern your area and your product types so as to ensure you have what you need ready. You may also want some signage to emphasise your USPs or unique selling points. Some signs you may want to consider for your stall are “All items are handmade by me”, “Everything is hand knitted!”, “Original Artwork by Helen Smith”, “Ask me about custom items!” and so on. Many crafters will also have a sign up with the address of their online store and/or their name on social media. There are lots of ways to present your signs that will help ensure they get noticed, match your branding and that they add to your overall look rather than distract from it. Small picture frames can look great with your notices inside. They are cheap and easily found in DIY stores, home shops as well as charity and thrift stores. You could repaint them to match your branding or stall colour scheme. Leaving the glass in the frames provides a bit of protection from weather, but removing the glass will cut down on weight and be safer if the frame is knocked off your stall. For small frames, you can replace the glass with a piece of acrylic cut from old packaging. Branding is a big subject, and I’d recommend you check out episode 5 “Branding for Craft Sellers” for lots more detailed info on this subject. Are you dressed to match your brand? If selling elegant, traditional bridal jewellery then it might be better to be dressed in an elegant manner rather than in jeans and a teeshirt. These are small and easy to transport. You can easily write additional information on the reverse. People may assume you will have a card, so this is perhaps the most common marketing material used by craft stall sellers. For lots more good reasons why business cards are worth the investment, check out my popular posts about business cards for craft sellers, here on the Tin Teddy blog. These are a great way to give your visitors information to take away with them. They have more space than a business card but are still economical. If you sell online you could create a simple flyer to promote your online store, especially if you offer items there that you can not sell at events, such as personalized items. Many print companies offer postcards for marketing purposes. Often these will have a picture (or collage of pictures) of your product/s on one side and your business details on the other. Being so much bigger than a business card, they offer a chance to include extra information, such as details of customised products, or additional options you can offer to customers buying online. Some craft show sellers get catalogues printed that they can give to customers to take home with them. Nowadays I see many sellers using digital formats such as CDs or small flash drives for this. Consider whether you will need a little box to hold your business cards or leaflets on your craft stall. If passers-by continually accidentally brush them onto the floor that will get annoying real quick. You could also include a business card or flyer with customer’s purchases. I will be talking much more about craft stalls in future episodes. I would love to hear your hints and tips for successful craft show planning. Please leave your comments below. The next episode of the Craft Seller Success podcast, episode 22 is called Packaging your Craft Products. It will be out on 5th February 2019. Thanks for listening. Please subscribe to the Craft Seller Success podcast. Check out www.TinTeddy.com for more Craft Seller resources. The Craft Seller Success Podcast from Tin Teddy. Below are links to the folding chair that I personally use for craft shows. It is available on Amazon.com (left link) and Amazon.co.uk (right link). If you use these links to go to Amazon and purchase the item, I will get a small commission for sending a customer their way. This is at no extra cost to yourself. Thank you.